There has been more to globalisation than just a rise in world trade. 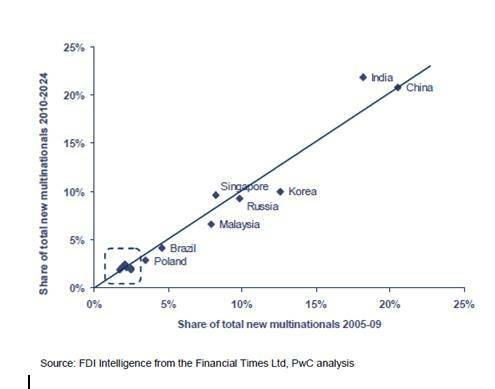 There has also been a significant increase in foreign direct investment (FDI) by companies from emerging nations too. The advance of globalisation is reflected in the number of companies establishing a presence in other nations. The easing of trade barriers and tariffs and the ICT revolution has underpinned globalisation. What is meant by the term 'globalisation'? Yes, that's correct. Well done. Globalisation is the growing integration of the world's economy.No, that's not right. The correct answer is A. B has arisen as part of the increase in globalisation and in a smaller way so has C. D is one of the factors which has been decreased and has led to part of the increase in global trade.Your answer has been saved. How might an MNC influence technology and expertise in the countries in which it works? Yes, that's correct. Well done. MNC's will often result in this process known as technology transfer.No, that's not right. The correct answer is B. A is sometimes thought to be a disadvantage of MNC's as they become involved in local politics. C is also thought to be a problem by some MNC watchers as they fear less social responsibility that that practices at home. D will hopefully take place but it is not normally though to be route by which technology transfer takes place.Your answer has been saved.